Each year the New Student Orientation (NSO) organizing committee invites Campus Ministry chaplains to present an interreligious dialogue on the university’s Jesuit values on the Saturday night of NSO weekend. This panel conversation introduces the incoming class to these guiding values and invites them to engage them through their own traditions and experiences. This year’s panel included Rabbi Rachel Gardner, Rev. Brandon Harris, Imam Yahya Hendi,V. Rev. David Pratt, Fr. Greg Schenden, S.J., and Brahmachari V. Sharan, and was moderated by Vishal Menon, a senior at the McDonough School of Business. 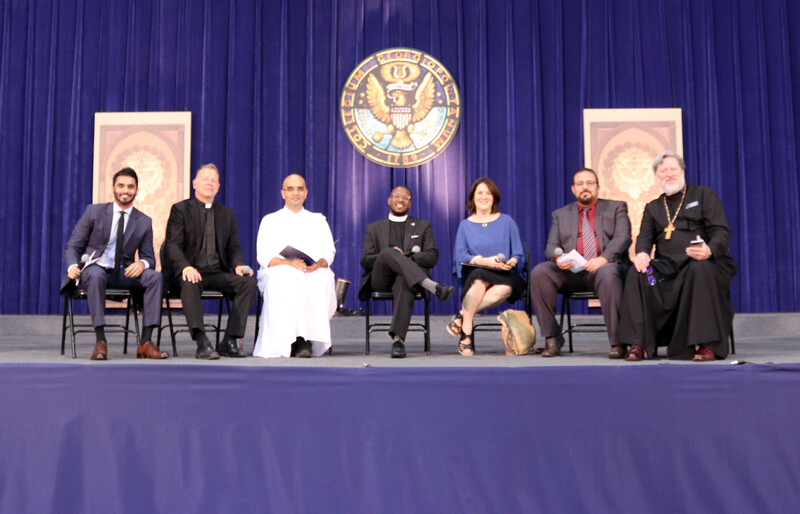 Menon opened the panel describing the ways the Jesuit Values have guided and influenced his time at Georgetown. He said, “they push you to dig deeper in finding the purpose and meaning behind your academic and extracurricular endeavors,” and urged the Class of 2022, to engage with the Values during their time at the Hilltop, and to think of them as a path toward creating a life of meaning and purpose at Georgetown, as well as after. Drawing from their faith traditions the chaplains encouraged the Class to live authentic and unique lives not just for themselves, but in service of one another. “We all have to exist in order that we exist ourselves,” said Imam Hendi. This call to live for the greater good also serves as a reminder to the rest of the university community of what we as an institution strive for—that in the midst of our differences we must remember our collective humanity. To hear the full panel, click on the Soundcloud player below.